Beauty Professor: Foundation Swatches for NC25-NC30 Skin Tones! 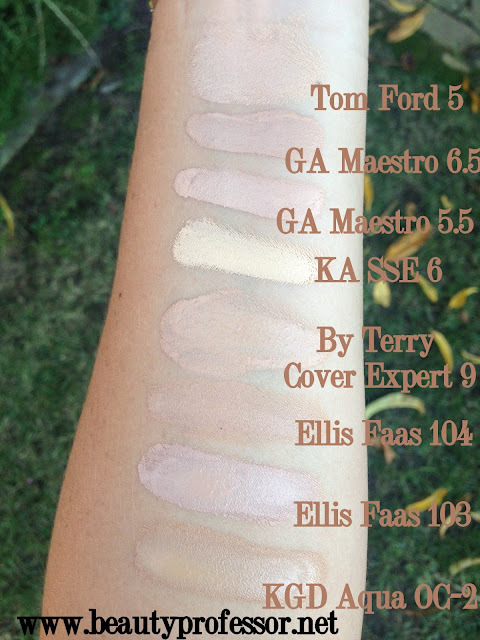 Finding a perfect foundation match is a Sisyphean task...as soon as you discover the right shade in ideal formula, the season changes (thereby altering the shade of your skin) and the search begins all over again! 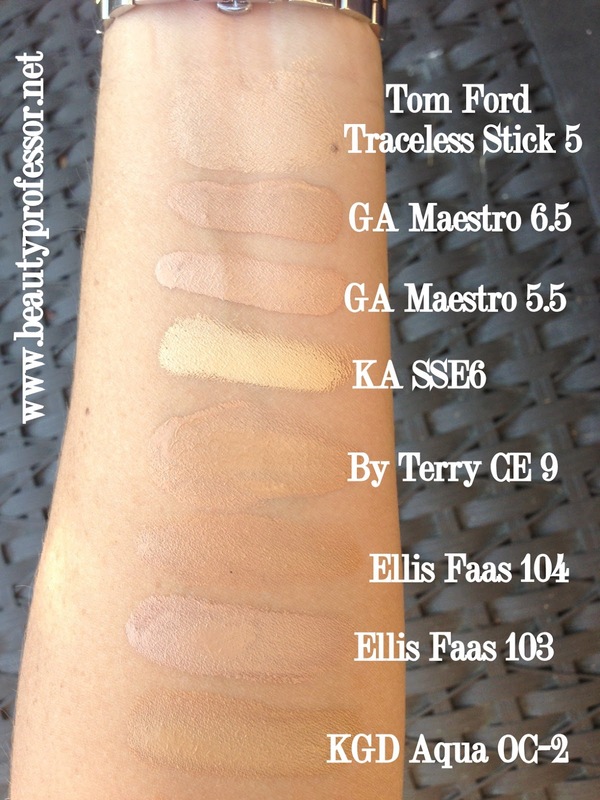 In response to the request of Ekirii, one of my lovely Beauty Professor readers, the following images reflect some of my favorite foundations in the NC 25-NC 30 range. I figured that if she needed to see the spectrum, perhaps other readers are in a similar situation, hence this post! As it stands right now, I am around a NC 27 or so and am currently enjoying wearing a lot of GA Maestro 6.5, By Terry Cover Expert in #9 and Tom Ford Traceless Foundation Stick in #5 (Natural). The Tom Ford foundation will be reviewed soon as it is quite new to my collection and fast becoming a favorite! All shades in natural light. 1. Koh Gen Do Aqua foundation in OC-2 is a very golden warm medium beige closest to a NC 30. 2. Ellis Faas Skin Veil in S103 is a light beige with neutral to almost pink undertones...it is a closest to a NW 25. 3. Ellis Faas Skin Veil in S104 is a medium beige with warm undertones...closest to NC 27-30...it is peachier (rather than gold) than the KGD in OC-2. 4. 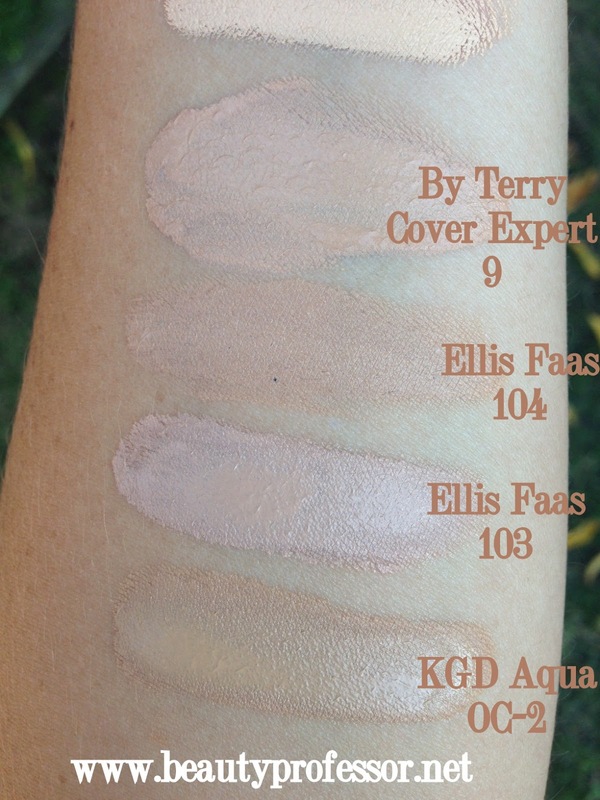 By Terry Cover Expert in #9 Honey Beige is a light to medium beige with warm undertones...it is closest to a blend of the Giorgio Armani Maestro in 5.5 and 6.5 though a bit yellower overall...about NC 27. 5. 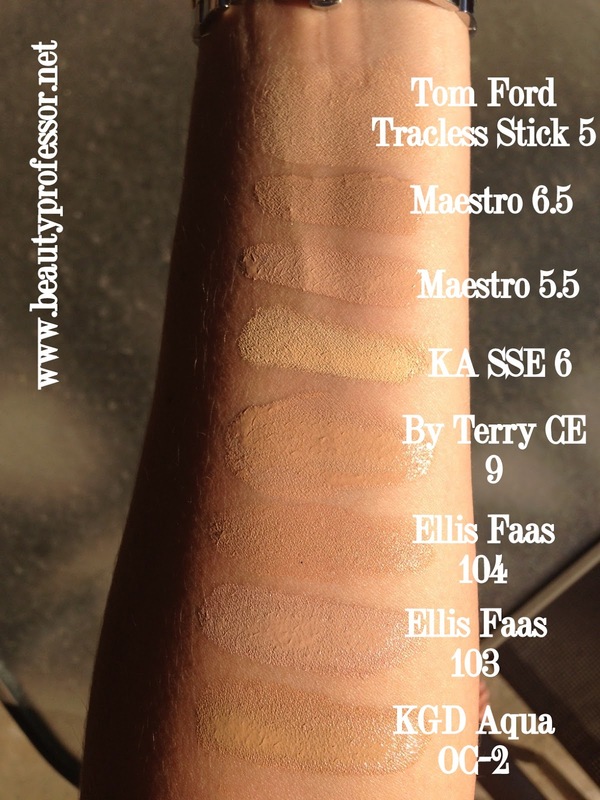 Kevyn Aucoin Sensual Skin Enhancer in #6 is closest to NC 25 (but more like NC 23 or so)...it is a light yellow beige that appears lighter than all other foundations in this lineup! Those who are in the NC 25 to NC 30 range would be better off in the SSE in #7 or #8. 6. Giorgio Armani Maestro in 5.5 is a light to medium peachy beige with mostly neutral undertones. Closest to a NC 25-27. 7. Giorgio Armani Maestro in 6.5 is a light to medium beige with golden undertones. Closest to a NC 27. 8. Tom Ford Traceless Foundation Stick in #5 (Natural) is a light to medium beige with warm yellow undertones closest to a NC 25-27...this is perfect for my fading, post summer skin! Thank you so much for doing this for me and for everyone out there with this shade range! It's definitely very useful and I'm sure everyone will appreciate those swatches :) Thank you for everything once again! My pleasure, Ekirii...I am glad that it is useful! Keep me posted on what you decide and have a wonderful week! Love your blog! I bought the GA meastro in 5.5 and the match is perfect! I need a match to the by terry expert. I was thinking 4 based on swatches. What do you think would be closest to GA 5.5? Thank you! So glad you like Beauty Professor ; ) If you are a 5.5 in Maestro, I think that you could get away with #4 or #7 (it is a bit more yellow but very similar in depth to Maestro 5.5). #4 is a bit more neutral to pink beige, but it is also equal to the Maestro 5.5 in depth. I think that the Maestro 5.5 is more peachy (a blend of pink and yellow) in undertone, so it is up to you which undertone you prefer in the By Terry. Hope that helps and do let me know what you decide! Thx for the blog! Just wondering, if I'm using bobbibrown beige 3, which maestro should I put on/try? Looking forward to receiving your advice! My pleasure...thanks for stopping by! 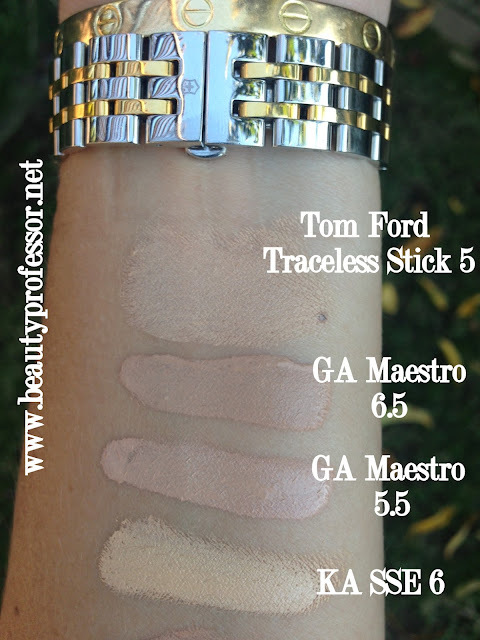 If you are matched to Bobbi Brown Beige 3, I think your best match in Maestro would be a #4.5. I look forward to reading your blog on a regular basis. Thank you for your kind comment...so happy you found your way to my blog! One of my main goals in maintaining this site is to help those who order online to find their perfect match (I know I always appreciate blogs that help me in this respect!). Both foundations that you are interested in are simply beautiful and have relatively similar lasting power (although Cover Expert may have a slight advantage in this area). The main difference between the two is coverage...the Cover Expert is full coverage and the Maestro is light to medium coverage. Do you have a coverage preference? I would say, in terms of coverage and wear, the Cover Expert is more similar in nature to the Double Wear (though a bit glowier)...the Maestro is just lighter in all ways overall! I hope that helps you in your decision...keep in touch and do let me know what you end up choosing! Thank you for you reply, I don't have a preference on coverage, I like to have a variety of coverages, just not really heavy. I think that I will get the By Terry first as I like the fact that it's similar to Estee Lauder but glowier. Have you tried this in shade 8? How much darker is 9 on your skin? You have beautiful products as well. My pleasure and thank you! I have tried the By Terry in #7, #8 and #9 and would say that #7 is a good match for NC 20-25 skin (I wear this in the dead of winter), #8 is a good match for NC 25-27 skin (can wear this for most of the year) and #8 is a good match for NC 30 skin (I wear #9 only in the summer). I hope that helps! !